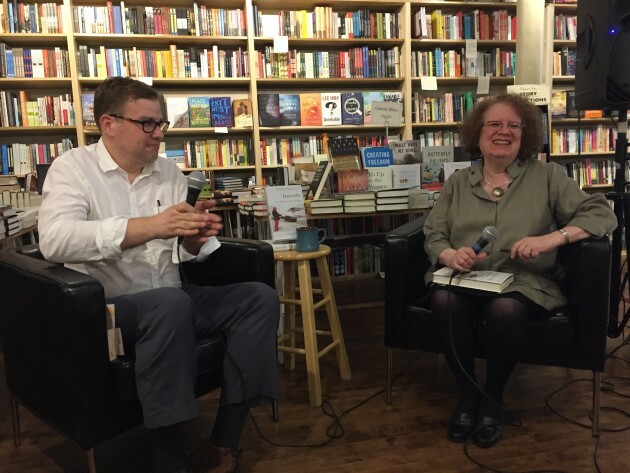 Amy Goldstein in conversation with Common Good Books' Aaron Rosenberg in May 2017 in St. Paul. Washington Post reporter Amy Goldstein spent five years researching "Janesville: An American Story," which was published this spring by Simon & Schuster. The book traces the ripple effect, over time, of the closing of the General Motors assembly plant, the town's major employer. Goldstein followed the lives of townspeople, including laid-off workers, job counselors, students, and others. Last night in New York the book was awarded the Financial Times and McKinsey Business Book of the Year Award. "It is an American story, as the subtitle suggests," said Dominic Barton, global managing partner of McKinsey & Co, who presented the award, "but also a truly global one." Goldstein was awarded a check for 30,000 English pounds (about $39,000) and each of the five runners-up received 10,000 pounds (about $13,000). "I am honored that the definition of a business book is expansive enough to encompass the story of the effects of vanished jobs on ordinary people and their community," Goldstein said this morning in an email. The runners up include "The Spider Network," by David Enrich; "Adaptive Markets," by Andrew W. Lo; "The One Device," by Brian Merchant; "Reset," by Ellen Pao, and "The Great Leveler," by Walter Scheidel.